If you ever get pitched by a company called Dressale.com, DO NOT DO IT. No matter how great the pitch might sound, it is not going to be worth the nightmare you're going to go through. I can speak from experience. I was contacted by them way back in January, and they offered me $30 in credit to their website, if I were to publish a giveaway post for them. I thought that was fair, so I went ahead and did it, expecting my payment to be ready as soon as I emailed my contact back. Well that's where it all started going to hell. The post went live on January 10th, and I was told I would be payed when the giveaway ended. I IMMEDIATELY responded with how my payment policy works, and I heard absolutely nothing back. It wasn't until February 11th when I was contacted again...only to be asked to repost the giveaway on my Facebook page. "I have to say, that unless I receive the $30 payment I was promised, I won't be sharing this, or any other post. I put up my blog post, as well as an additional post on my Facebook page, and still have yet to receive payment." Two hours later, I received an e-mail letting me know that my account had been credited, and asking if I would share the giveaway post again. Obviously I didn't share the post, because I was a bit perturbed at this point. Well, I went about trying to find something to use my credit one, because dammit, I had invested too much time into this to not get something for my hard work. I found a couple of fascinators that I thought would be nice for Steampunk, and after making sure they were well under my limit, I went to check out...where I found out that I had zero choice in shipping choices. The absolute least I could pay for shipping two fascinators that weighed less than a pound was $13.79! That insane amount of shipping made my credit go over, so I paid $4.77 out of my own pocket to just be done with this ridiculous nightmare. About a week later my items arrived, in the worst packaging I have ever reen. Each fascinator was wrapped in a single cellophane bag, with no padding whatsoever. Those two bags were shoved in a UPS bag, that again, had no padding or protection for what I think to be fragile items. Then I opened them, only to find out that what I thought I was getting was way off from what I actually received. Well look at that, it's broken. The beads were just loosely hot glued to the tulle. The clip is insanely small. And glued on in such a way that it makes it impossible to open. Because I tried, I tried really really hard to get this clip to work, but the only way to fix it is to rip it off, and replace it with a barrette clip, because this alligator one is just useless. Look at that, MORE beads that were poorly glued on. I'm going to have to sew all these to the tulle, which won't take much time, but it's the idea that i shouldn't have to fix a brand new item that has never been worn, due to crappy construction. 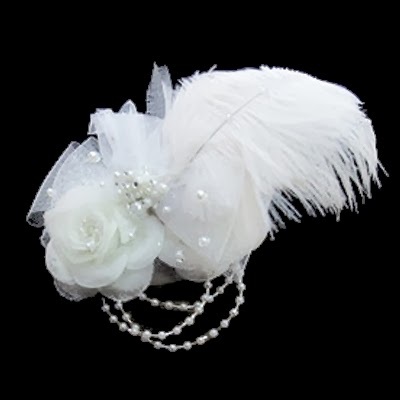 The Website photograph of the second fascinator. Doesn't that look like a birdcage veil, that is full, and lovely, and will go around your face? This is what I received. A singe piece of millner's veil in a long rectangle, that just falls in your face and looks dumb. I'm going to have to ripoff the veil, and try to reposition it, and sew it back on in a way that it's supposed to look. This fascinator also has one of those useless alligator clips that is so small, and glued on in such a way, that it makes it impossible to use. I'm going to have to replace this one as well. Not to mention, the actual flower part is just crushed, and covered in glue threads. So, after all that, I emailed the company again, saying that I wanted a refund for my $4.77, since my merchandise was pretty messed up and useless. That was a week ago, and I still have yet to hear back from them. TL;DR - DO NOT EVER EVER EVER WORK WITH DRESSALE.